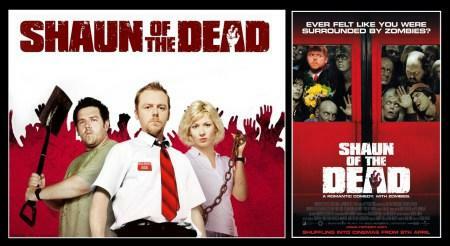 My posts for this our second theme, can be found here at 2 Reel Quirky Cats with the first of our reviews on Cockneys vs Zombies (2012) – with a link to Thoughts All Sorts in this post – along with our monthly poll. Next week we will reveal Thoughts All Sorts choice for this topic and in our final post this month we review our Poll Winner. If you want to read more of our themed posts, you can read my previews on the Guilty Pleasures here…. On Shanannigan’s blog, Reads and Reels she reviews TV, films. books and runs book tours. She can also be followed on Twitter with a link to her page HERE. This is so fun! Not sure if this is classified as a guest post, or a buddy post but it’s a fantastic collaboration with Realweegiemidget Reviews, and Thoughts All Sorts @2ReelQuirkyCats ! I had been invited to review a movie trailer of my choice and instantly Shaun of the Dead came to mind! It’s one of my all-time favourite movies! Hilarious, clever, freaky and best of all, a perfect metaphor for the complacency of human beings! It’s just brilliant! I chose an extended trailer even though it reveals a little bit more of the movie than I would normally like to see. I did this, because if you haven’t seen it at this point, then perhaps if you see more of what it has to offer, you’ll be inclined to give it a try. Honestly guys, you HAVE to see it! Yes, there are many squeamish scenes but it’s not all horror. I don’t even know if I would classify it as a horror because it is so funny! Not to mention, it delivers such clever (and bang on) commentary on the state of society. Many films have tried and failed, to emulate it since. Imagine, a trailer that reveals so much and yet, it’s really only the brain stem of the complete zombie entrée. If that doesn’ t scream Awesome Movie; I don’t know what does. Shaun of the Dead offers so much more. Laughs, scares, and even tears. I dare you to watch this trailer and not want to watch the movie after. I know I did! Get in touch with these cool “cats” right here! A big thanks to the lovely Shanannigans for allowing us to add her post, which was copied in full with no alterations. If you are a blogger and would like to be featured here as one of the 2 Reel Quirky Cats monthly Guest Posts, please drop a line to me via my Contact Page.. In your email add your blog, choice of preview and the topic choice and after I chat with Thoughts All Sorts, we can approve your request and provide some possible dates. Also write to me individually, if you would like me personally to review your book, TV Programme or movie. Search for a Year, Who or What You Are Looking For.. Enter your email address to follow Realweegiemidget Reviews and receive notifications of new posts by email. www.weegiemidget.wordpress.com and Gillian Jacob 2015 - 2019 unauthorized use and/or duplication of this written material without express and written permission from this site’s author and/or owner is strictly prohibited. Excerpts and links may be used, provided that full and clear credit is given to Gillian Jacob and www.weegiemidget.wordpress.com and with appropriate and specific direction to the original content. All photographs and trailers have been referenced as are not my own. I believe these fall under Fair Use, please contact me as no copyright infringement has been intended. BLOGATHON... Announcing My Then and Now (Now and Then) 2017 Blogathon! FILMS... Gotta Sing! Gotta Dance! Gotta be Fred Astaire!